Photon Noise, Dark Noise, Read Noise…, Confused? Idea is to come up with brief, somewhat palatable explanations for all levels of astro imagers; cold links and references to complex outside resources is not the goal. Thanks for your understanding! Edited by mmalik, 14 December 2014 - 05:23 PM. I would start with a key point that should clarify these things and keep the terminology consistent with technical literature on these topics: The only difference between noise and signal is what you are trying to measure in a given situation - it has nothing at all to do with randomness. What is signal in one context is noise in another. The terms are used with this flexibility for good reason - just as big and small change meaning depending on context. The only place I see an insistence that noise must be "random" is in amateur astro writings - including some amateur books. This is completely at odds with the way the terms are used in scientific and engineering contexts - particularly in imaging sensors. With that clarified, it makes it easier to talk about one of the main terms involved in calibration - and that is "pattern noise." This is noise that appears possibly random or structured across the sensor - but it approximately repeats in each frame. Since it repeats, you can estimate what it is in each frame and subtract it. So - this is a form of noise in each frame - but it has a repeating pattern - and after subtraction you then have less noise. If you insist that noise must be "random" - then there is no way to talk about what just happened - when a noisy image suddenly became less noisy. This is perfectly fine and captures a key motivation of the calibration process - to reduce noise by subtracting pattern noise. A given pixel has several things that characterize it. It has a fixed offset value, and on top of that it has a random read noise with some sigma injected once when it is read, and it has a certain amount of dark current that accumulates over time. In addition, it has some particular sensitivity to light that determines how efficiently it converts photons to electrons. Each pixel will have its own values of these parameters - and the goal of calibration is to make them all behave the same way by removing the variation between pixels. Separately, there is the concept of shot noise - which is present any time you have discrete objects arriving at a roughly steady rate - whether it's photons or rain drops. If on average you collect 100 of these in one second, if you actually measure the number in each second it won't be 100. It will be 91, 108, 97, 115 - etc. There will be a mean rate of 100, and a standard deviation of sqrt(100) = 10. There is no avoiding this due to the randomness of the arriving objects. The goal of imaging is to measure this average rate of arrival - but each image will have this random component in it. Since it is undesirable - it is noise. Shot noise. How does random noise add? In quadrature. If you have meter sticks that have +/- 1 cm length error, and you put two of them end to end - the total length will not be 2m +/- 2cm - it will be 2m +/- sqrt(2)cm. And if you add 100 of them, the result will be 100m +/- 10cm. The random noise terms add with a square root. There are two main aspects of imaging - one is to subtract noise terms that you can characterize - and thereby actually reduce the noise. That amounts to creating an image of the pattern noise and subtracting it. The other aspect is to stack many images together. This does not reduce the noise - it increases it - but the random noise will increase slower than any signal in the images - and the final SNR will increase. Both signal and noise will increase - but signal will rise above the noise because it accumulates differently, without the sqrt(). Pattern noise is present in the bias, darks, and flats - so you want to remove it from the sub exposures as well as you can. Then you can stack images that are as identical as possible, and only contain unavoidable shot noise. That's an intro summary that I hope clarifies things. Edited by freestar8n, 12 December 2014 - 08:25 AM. The other aspect is to stack many images together. This does not reduce the noise - it increases it - but the random noise will increase slower than any signal in the images - and the final SNR will increase. Both signal and noise will increase - but signal will rise above the noise because it accumulates differently, without the sqrt(). Wouldn't that only be true if you ADDED the subs together? If you AVERAGE the subs together, signal does not increase, but noise DOES decrease. This is empirically testable, a simple observation will tell you that it is true. The only place I see an insistence that noise must be "random" is in amateur astro writings - including some amateur books. This is completely at odds with the way the terms are used in scientific and engineering contexts - particularly in imaging sensors. Averaging. It's the staple of integrating astro images, and we have some fairly advanced algorithms like Winsorized Sigma Clipping Average that can do a pretty good job of identifying and rejecting non-random elements of each sub if we use dithering. The difference between averaging and adding is largely semantic. There is no difference in the SNR or appearance of the result. I think it is clearer to describe things simply in terms of adding - because ultimately you are relying on the accumulation of data - and the actual increase in count of photon events in each pixel. It is inherently an accumulation of data and information. You can then take the end result and divide it by the number of frames - or you could divide it by the total accumulated exposure time in seconds. The result would then correspond to the number of adu per second in each pixel. If you include the gain, you have the electrons per second in each pixel. You could divide it by any crazy number and it will look the same. But if you get the final image somehow and then divide the whole thing by a number - nothing has changed at all except the overall scaling. The inherent SNR improvement is there and is due to the statistics of the accumulation process. So - for clarity I am just talking about accumulating and adding up the counts in each exposure - because it helps get the point across that you are accumulating both signal and shot noise over time - but signal grows faster because it is linear, while shot noise goes as the sqrt(). As for "noise must be random" - anyone who uses the term "pattern noise" is in violation of that assertion - which means most any technical article on ccd and cmos sensors. Textbooks related to noise measurement and SNR tend to ignore the definition entirely - just as you would not lay down the law and demand that "big" must refer to objects greater than 1m in length. I don't know any professional source who claims "noise must be random" - yet I see it often in amateur discussions. As for qsi and apogee - they are both sellers of ccd's largely to amateurs - and you appear to be citing their ads and marketing material. I am talking about textbooks on imaging sensors and discussions of SNR in professional astronomy. One example is cosmic microwave background. If you are doing microwave astronomy and trying to study certain objects - that background is noise. But if you are actually studying that background to measure its anisotropy - it is signal. cf. "One man's signal is another man's noise." Edited by freestar8n, 12 December 2014 - 01:53 PM. Ok, I agree with that. Thanks for the clarification! Out of curiosity, what textbooks would you recommend for someone interested in getting a more well-rounded scientific opinion on signal, noise and SNR? Edited by Jon Rista, 12 December 2014 - 02:16 PM. "One man's signal is another man's noise." Edited by mmalik, 12 December 2014 - 04:50 PM. Before getting to the first one, let get to one commonly used yet NOT well understood term, Poisson Distribution. It as a fancy term for a sequence of known averages, that's all. 'Average' is the genius, not the distribution! Take for example, you receive 10 calls from 'random' callers all over the country in a typical day at the office; that being average, receiving 2 calls on occasion is not going to make much difference in the average number of calls you receive on an ongoing basis. That number (10) is not going to change much whether you take time off or not; in other words you can confidently make 10 call probability whenever you are in office. That's Poisson Distribution. This will be a good segue into the first topic, Poisson Noise. Edited by mmalik, 14 December 2014 - 03:22 AM. 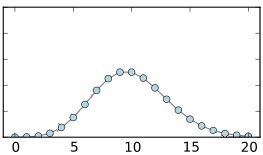 The distribution looks as shown above - with no counts below zero, and rising to a peak then descending. It has a special property that the standard deviation (sigma) of the distribution is the square root of the mean. For a distribution with a large mean value - the shape approaches a Gaussian. You get this distribution when you count objects that are arriving randomly and independently - but at a steady average rate. The objects don't interact with each other - so they could arrive at the same time possibly. In imaging, all pixel values are ultimately a count of electrons. Those electrons come from several sources that arrive at a steady rate: photons from the object itself arrive at a steady rate - and most of them are converted to electrons. Heat in the sensor causes dark current electrons to arrive steadily also - and those are undesirable. Sky background also contributes photons that then create electrons adding to the background counts. Each source of electrons will cause the electron count to grow steadily in that pixel. If you expose that pixel for the same amount of time in many successive exposures - the total electron count will be different in each one - and the distribution of those counts will obey the Poisson distribution. Altogether the pixels will have some mean count, N, in them - and the standard deviation of the spread around that mean will be sqrt(N). That doesn't apply in general to arbitrary distributions of numbers - but it does apply to situations like arriving photons or rain drops - and sigma = sqrt(N). Each individual source of electrons will contribute its own mean value of electrons, S, and the noise in that contribution will be sqrt(S). In all this stuff - N does not refer to the raw adu value - but the electron count. You need to know the gain (e/adu) of the sensor to convert the adu value to electrons in order to know the electron count - and the square root of that is the noise. So - photon noise refers to the shot noise in the arriving stream of photons - when counted in consecutive intervals of the same length of time. Dark current is the slowly arriving electrons in a pixel from the heat of the sensor - and since the electrons are arriving steadily there will be shot noise in the count - and that is dark noise or thermal noise. Read noise is completely different - and it is a burst of electrons added a single time when each pixel is read out. When you read out - there will be a fixed number of bias electrons - plus a roughly gaussian distribution of read noise - and the sigma of that distribution is the amount of read noise. So bias is a fixed value of electrons - and read noise causes the actual count to be slightly different. All the stuff above applies to a single pixel. If pixels in the sensor behave differently in any of these properties - it results in pattern noise in the image. If there is extra dark current here and there, or some pixels are less sensitive to light - there will be a pattern that is visible in many successive images. That pattern stuff is often ugly and always undesirable. Sometimes it is random across the image - or it could be bands or spots or anything. If it repeats the same distribution over time - it is a form of pattern noise. Different forms of pattern noise are present in the bias frame, the dark frame, and the flat. Thanks Frank; great explanations of some main categories of noise in a sensor. I presume this should take care of the major noise types and their disambiguation. Open to hear more if we may have missed any major noise type thus far? Edited by mmalik, 16 December 2014 - 02:59 AM. What is signal in one context is noise in another - it makes sense, mainly if we change "is" for "can be"
For electronics, noise is a signal without any pattern. A non repetitive signal. Every body forget that astrophotography, using electronic digital cameras, present real noise in the photos. Dark current, bias level are sensor characteristics. However, any electronic amplifier produce electronic noise; a random noise. You see it very well changing ISO. Some areas of camera are shielded because of sensitivity to generate noises and/or distortion of signal (analog level and phase distortions). Edited by jsmoraes, 14 December 2014 - 06:03 AM. My main point is that the terms noise and signal are used very flexibly and depend on context. As a result, the term "random noise" is not redundant. There are probably engineering domains where journals would insist that the term "noise" never be used for something that isn't fundamentally "random" - but I don't know any. There is an implication in amateur circles that it is incorrect and sloppy to use noise for anything unwanted that obfuscates the "signal" - but in fact that is mostly how the terms are used. So - in the specific case of pattern noise this can all be described and it shouldn't be too confusing. When you look at a master dark, it will have some hot pixels - and also some ugly pattern of warm and cold pixels. That pattern is due to a variation in the dark current being pumped out at each pixel. So - if you want to capture that variation, then you want to measure it carefully. Now - this ugly pattern is the signal that you want to measure. But since it is Poisson in nature - it will have noise on top of it - that makes it hard to measure exactly. So you accumulate many dark exposures and study them to pull the "signal" out from the "noise". And this relies on the standard practice of accumulating many exposures so the "signal" rises over the background shot noise. Once you have a good image of this dark current pattern, you can subtract it from one of your lights - and the image will improve - because the unwanted stuff has been removed. That is exactly what happens in long exposure noise reduction - but just using a single dark. A single dark at the same temperature will give a good estimate of the pattern noise (dark current in each pixel) so it can be subtracted - and "reduce the noise." Truly random (whatever that even means) noise cannot be reduced because you cannot predict it at all. You therefore can't subtract it. But pattern noise is repeatable and can be modeled and predicted - so you can subtract it. Canon wouldn't call it noise reduction if it didn't actually reduce the noise. It isn't just smoothing - it actually reduces one of the noise terms - pattern noise. Edited by mmalik, 14 December 2014 - 04:40 PM. I think your terms are somewhat overlapping. I would separate things like dark current, which grows linearly, from dark noise - which is the shot noise that results from that contribution of electrons. There are many sub-types of random noise: white noise, pink noise - etc. They all have their own probability distributions. In imaging, I think most "truly random" noise terms are either Poisson or basically Gaussian. Read noise is usually viewed as Gaussian. Things that involve the slow accumulation of discrete events will be random with Poisson distribution - and have shot noise. Read noise will contribute with a Gaussian distribution on each exposure read. A key distinction about pattern noise is that it is constant in space, but varies somewhat in time. So pattern noise does have a random behavior in time - and the distribution across the sensor could be completely random or structured. But whatever that pattern is - it is the same in multiple exposures. So - you can predict it somewhat. You can't predict its value exactly because it does have a random component in time. But you can get close enough to improve things when you subtract it. So - it is somewhat hard to break down and classify everything. I think it's mainly important to understand the concepts because with things like noise - the meaning comes from the context rather than a strict definition. It might be helpful to explain the differences between Poisson and Gaussian. I have a basic understanding, but I am curious to hear what you guys have to say about the differences there. Especially in the context of this discussion. I know both are random distributions, but there are differences. Poisson corresponds to counting a number of things, and the probability of coming up with a certain value. As a result, it only applies to non-negative integers. The probability of getting 1.5 is zero - and the probability of getting -1 is zero. With Gaussian - there is always a probability - although small - of coming up with any real number - positive or negative. For very small counts like slow dark current - the dark *current* value (signal if you want) could be 2 electrons in one exposure, 0 in another, 3 in another. If the mean count is 2, the noise in that count will be sqrt(2). It's ok for the sigma not to be an integer. The fact that it has a peak - in this instance near 2, but it can never be less than 0, means it rises quickly from zero and then drops down after 2. There is always a small chance of getting some giant count like 1000 or 100000000 - but it is small. If it were a Gaussian distribution with mean=2 and sigma=sqrt(2) - it would peak at 2 but it would be symmetric about 2 - and it would extend from -infinity to +infinity. For small things like slow dark current- there is a big difference between the two. But when the mean is large there isn't much difference. They both are peaked near the mean and fairly symmetric about that peak. Another key difference is that with Poisson, the sigma is always sqrt(mean) - and it always applies to counts. 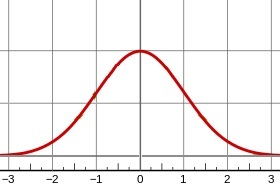 With Gaussian it applies to any kind of number - and the sigma has no relation to the mean. They could be anything. At larger quantities, Poisson distribution approaches a normal (or Gaussian) distribution making shot (or Poisson) noise indistinguishable from true Gaussian noise. In other words, large numbers of photons/elections will make Poisson noise look much the same as Gaussian noise. Gaussian noise in itself can have many sources, e.g., poor illumination (dark noise or shot noise), thermal noise from high temperature, or noise from downstream electronics. Normal (or Gaussian) distribution is commonly referred to as the bell curve, and is a probability function where any real observation will fall between any two real limits or real numbers, as the curve approaches zero on either side. Again, don't be confused by the verbiage; average or mean is the genius once again, not the distribution. Edited by mmalik, 14 December 2014 - 06:20 PM. I think it's important to emphasize that a Poisson distribution with high mean, m, is nearly a match to a specific Gaussian distribution with the same mean, m, and sigma = sqrt(m). You could have a different Gaussian with the same mean value but a totally different width. In other words - if you know the mean of a Poisson you know everything because the sigma is sqrt(mean) - but with Gaussian you need the mean and the sigma to know the full shape. If you have a Poisson distribution with very low mean - you know that its shape is too asymmetric to be matched to any Gaussian. But with high mean, you can find a Gaussian that matches it in location, width, and shape. It is important to know that shot (or Poisson) noise is mainly a manifestation of low signal (small current) conditions; as the strength of the signal increases, the relative proportion of shot noise decreases. Since Poisson deals with smaller quantities/numbers; hence when small number of photons (low signal) hit sensor, relative fluctuation in brightness are significant and those fluctuations show up as shot noise (see below). Edited by mmalik, 16 December 2014 - 12:32 PM. Edited by mmalik, 16 December 2014 - 10:33 AM. Shot noise is present in the signal at all strength levels, not only weak signal levels. It is just that at higher signal levels, shot noise is still the SQRT(Signal), and therefor a much smaller relative component. Shot noise is a problem at low signal levels because SNR is low, and at low enough signal levels, signal becomes difficult to distinguish from noise. Shot noise is barely visible at signal levels near FWC as it is overpowered by the signal. Shot noise exists throughout the entire signal range, though. With shot noise - the noise increases with the signal - but it increases more slowly than the signal. It's important to distinguish higher SNR from lower noise. Higher SNR just means the ratio of signal to noise increases. So - don't say you expose longer to lower the noise. But you do expose longer to increase the SNR for a given signal. And note that a given image doesn't have a single "SNR". The SNR varies all across it depending on how strong the signal is there. But for a given point in the image - as you accumulate more exposures - the SNR will increase even though the noise is increasing. The stuff about white noise normally doesn't really play a role in imaging and I would just remove it from the discussion. White, pink, 1/f noise are all aspects of noise that relate to how it behaves in time, and how one value is correlated with the next. When you see the distribution in values that get generated and show it as a histogram - there is no information on *how* those values appeared in time. So the frequency domain info isn't available and isn't relevant to the imaging/stacking process. Shot noise and Poisson noise applies to both strong and weak signal. When it involves counting objects in an arriving stream - it is Poisson whether the signal is strong or weak. For strong signal you can *approximate* it as a specific Gaussian with the same mean, S, and standard deviation, sqrt(S) - but that's an approximation. Strong signal doesn't turn Poisson into Gaussian - it just makes it possible to view it as roughly Gaussian. As soon as you say - well - the signal is S, so the noise is sqrt(S) - you are assuming it is Poisson. If you simply assumed it was an arbitrary Gaussian with mean, S, the noise could be anything and you wouldn't "know" it a priori given the signal. Edited by freestar8n, 16 December 2014 - 08:03 AM. 4. Fixed-pattern noise (also called Banding noise) is a noise pattern during long exposures where certain pixels produce brighter intensities above the general background noise. Note: Dark current can also produce fixed-pattern noise. Edited by mmalik, 19 December 2014 - 12:58 PM.